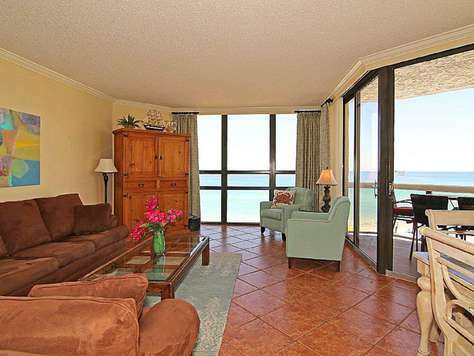 Our spectacular 3 bedroom/3 bath at Surfside Resort has spectacular direct Gulf front views! Our unit provides unsurpassed panoramic views of the emerald-green Gulf water that are truly breath-taking! Our unique and open floor plan allows all bedrooms and living areas to have fabulous ocean views and balcony access! Our unique, angled, floor plan provides ocean views from all rooms. This is 'NOT' your typical shot-gun style floor plan. All rooms are angled and open with glass doors/windows from ceiling to floor. Additionally, all rooms open onto a huge 28-foot balcony overlooking the pool and beautiful Gulf. Our unit is very open, large, and has nine-foot ceilings. Unique features of this building include air-conditioned interior hallways and enclosed parking. 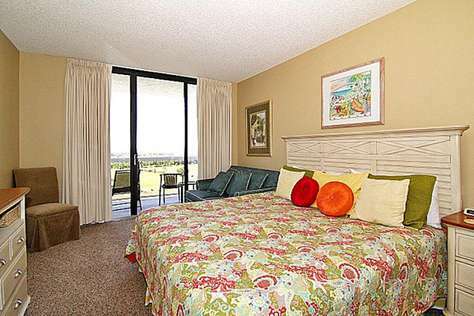 Surfside Resort provides one of the area's most complete array of amenities. A huge master bedroom with a king-size bed with Gulf views, beautiful furnishings, TV, large lighted walk-in closet, vanity table, and spacious master bathroom. The second bedroom also has an ocean view with 2 queen size beds with beautiful furnishings, TV, closet, and full bath with tub and shower. The 3rd bedroom has king bed with small sofa, flat screen TV & private balcony overlooking the emerald waters of the Gulf. Our fully-furnished kitchen includes dishwasher, stove, refrigerator, microwave, disposal, coffeemaker, blender, toaster, plates, glasses, cookware, utensils, bowls, etc. We have added many personal touches/items. Your every need has been anticipated. POLICY PROHIBITS RENTALS TO ANYONE UNDER THE AGE OF 25, OR PETS OF ANY KIND. The Hotel Room (lockout suite) offers a king size bed and private balcony. Complete with microwave, refrigerator, coffee maker and iron. OCEAN FRONT pools (heated during cooler seasons). RELAXING gulf front spas, saunas, lighted tennis courts, and OCEAN FRONT picnic pavilion, jacuzzi, outdoor barbecue grills, basketball and volleyball courts and MORE. There is a wonderful walkover from the pool area directly onto the beach for your added privacy and convenience. Full linens, towels, etc. are provided. Expertly furnished and accessorized. Destin's most popular theme parks, and seven of Destin's most popular golf courses are within 4 minutes. Rent boats (pontoon, or motorboats or jet skis) beach front and/or nearby. Bikes and scooters also available. Several of Destin's most popular restaurants shops are within 1 mile of Surfside. The Gourmet Kitchen has eat-in bar, granite countertops, top of the line appliances. The second bedroom offers a queen with separate bath. Our unique angled floor plan has incredible Gulf views from every room. Our LIVING ROOM/DINING ROOM COMBINATION is PROFESSIONALLY DECORATED and includes, ENTERTAINMENT CENTER with TV/DVD, STEREO SYSTEM with CD player BEAUTIFULLY MIRRORED WALL. The dining room has seating for six. Our REMODELED kitchen features, BEAUTIFUL COUNTERTOPS, NEW appliances, Custom CABINETS, breakfast BAR, Stove, refrigerator, microwave, disposal, washer/dryer, full linens, etc. We have added many personal touches and items. Your every need has been anticipated. Unit has a beautifully decorated MASTER BEDROOM with a king-size bed, FLAT SCREEN TV, large lighted walk-in closet, and spacious master bath. The SECOND BEDROOM features 2-QUEEN SIZE beds FLAT SCREEN TV/DVD and full bath. Reserve your favorite 'WEEK AT THE BEACH' today in ' OUR-HOME-AWAY-FROM-HOME'. SURFSIDE RESORT is one of DESTIN PREMIER condominium resorts! This is a beautifully decorated 2BR/2BA upscale condo with AWESOME VIEWS!!! Emerald green waters, Sugar White sand beach, dolphins romping in the surf, sea oats, and the most majestic sunsets anywhere, they all are a part of what you can soon call home..
Unit 305 offers a large Master Bedroom Suite featuring a Gulf view, lighted walk in closet, Large Shower area, and more. This is a split floor plan....the secluded second bedroom suite offers a Gulf view, two full sized beds, Flat Screen TV closet, and a full bath. Kitchen is fully equipped, just like a home with breakfast bar and table four 4. The dining room has seating for 6. 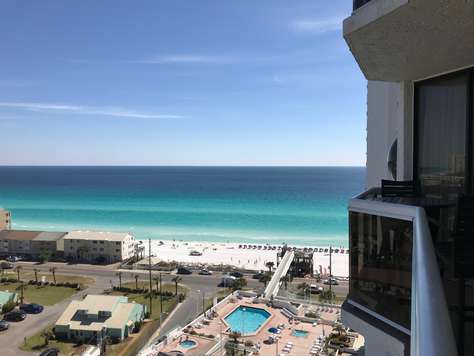 The BEAUTIFUL WHITE SAND of MIRAMAR BEACH (DESTIN) and the BEAUTIFUL WATERS of the GULF are ONLY STEPS AWAY, and OFFER as MUCH or as LITTLE ACTIVITY as you DESIRE! Our AWESOME condo is a 'NON-SMOKING/NON-PET' unit and OUR ASSOCIATION POLICY PROHIBITS RENTALS TO ANYONE UNDER THE AGE OF 25 YEARS OLD. Reserve your favorite 'WEEK AT THE BEACH' today IN 'PARADISE ' OUR-HOME-AWAY-FROM-HOME'. Our SPECTACULAR, 1,535 square feet, 3 BEDROOM/3 BATH CONDO AT SURFSIDE BEACH RESORT has AWESOME VIEWS of the EMERALD GREEN WATER of the GULF OF MEXICAO. We have a very opened floor plan with GLASS DOORS/WINDOWS from CEILING TO FLOOR. All rooms, except the 3rd bedroom lockout open onto a 28 FOOT BALCONY. The THIRD BEDROOM opens onto private 14 FOOT BALCONY. Balcony enclosures have clear glass for UNOBSTRUCTED VIEWING. THIRD BEDROOM lock out (HOTEL UNIT) 2 queen size beds. A huge MASTER BEDROOM with a king-size bed, FLAT SCREEN TV large lighted walk-in closet, and spacious master bath with large glass-enclosed tub/shower. The bedroom features queen bed, TV/DVD and full bath. THIRD MASTER (HOTEL ROOM) can be rented as a 1 BEDROOM. It has OWN PRIVATE ENTRANCE with TWO QUEEN SIZE beds, 18” TILE, TV/DVD, large closet, private FULL BATH, REFRIGERATOR, microwave, coffee pot, dishes, linens. Our LIVING ROOM is BEAUTIFULLY decorated and includes , ENTERTAINMENT CENTER with FLAT SCREEN TV, STEREO SYSTEM with CD player. DINING ROOM has seating for six. The REMODELED kitchen features, GRANITE COUNTERTOPS, BLACK APPLICANCES, CUSTOM CABINETS, breakfast BAR, TITLE BACK SPLASH, Stove refrigerator, microwave, disposal, washer/dryer, full linens, etc. We have added many personal touches and items. Your every need has been anticipated. Destin's most popular theme parks, and seven of Destin's most popular golf courses are within 4 minutes. Surfside is adjacent to Seascape Golf Course, very close to Silver Shells Designer Outlet Mall, Destin Commons Mall, Cinemas, and many wonderful restaurants & Winn Dixie. Rent boats (pontoon, or motorboats or jet skis) beach front and/or nearby. Bikes and scooters also available close by. Our SPECTACULAR, 1 BEDROOM/1 BATH CONDO AT SURFSIDE BEACH RESORT has AWESOME VIEWS of the EMERALD GREEN WATER of the GULF OF MEXICO. We have a very opened floor plan with GLASS DOORS/WINDOWS from CEILING TO FLOOR. The bedroom opens onto a large balcony enclosure for UNOBSTRUCTED VIEWING. Surfside also provides open and COVERED DECKING with PICNIC TABLES ON THE SKY BRIDGE where you can WATCH GORGEOUS and ROMANTIC SUNSETS while you sip your afternoon beverage. Or you can enjoy watching the PLAYFUL DOLPHINS and/or watch the INTERESTING TOURISTS walking and basking on what is RANKED as one of the TEN MOST BEAUTIFUL BEACHES IN THE WORLD. All rooms, except the 3rd bedroom lockout open onto a 28 FOOT BALCONY. The THIRD BEDROOM opens onto private 14 FOOT BALCONY. Balcony enclosures have clear glass for UNOBSTRUCTED VIEWING. THIRD BEDROOM lock out (HOTEL UNIT) that SLEEPS 4. A huge MASTER BEDROOM with a king-size bed, FLAT SCREEN TV large lighted walk-in closet, and spacious master bath with large glass-enclosed tub/shower. Teh second bedroom features Queem bed TV/DVD and full bath. THIRD MASTER (HOTEL ROOM) can be rented as a 1 BEDROOM. It has OWN PRIVATE ENTRANCE with TWO QUEEN SIZE beds, 18” TILE, TV/DVD, large closet, private FULL BATH, REFRIGERATOR, microwave, coffee pot, dishes, linens. STEEL APPLICANCES, CUSTOM CABINETS, breakfast BAR, TITLE BACK SPLASH, Stove refrigerator, microwave, disposal, washer/dryer, full linens, etc. We have added many personal touches and items. Your every need has been anticipated. 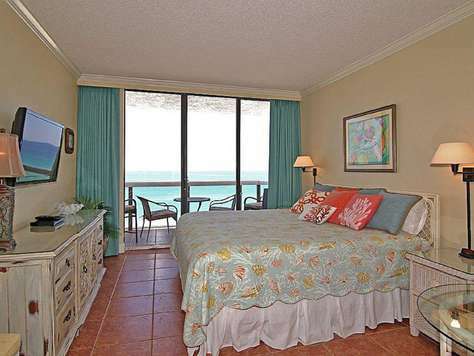 CONDO AT SURFSIDE BEACH RESORT has VIEWS of the EMERALD GREEN WATER of the GULF OF MEXICAO. We have a very opened floor plan with GLASS DOORS/WINDOWS from CEILING TO FLOOR. GORGEOUS! SPACIOUS! STUNNING VIEWS OF THE GULF! ENJOY all the LUXURY AMENITIES this BEAUTIFUL 16 story BEACH RESORT has to offer. 6th floor OCEAN FRONT! Beautiful Gourmet Kitchen with eat-in bar, granite countertops, top of the line appliances. Master Bedroom Suite has a luxurious queen size bed with connected has granite counter tops raised cabinets. bath. The Guest Bedroom offers two full size beds with separate bath, granite & raised cabinets. The Hotel Room (lockout suite) offers a king size bed and private balconey with granite and raised cabinets.. Our unique angled floorplan has incredible Gulf views from every room. You are in "Paradise" when you book this unit! You will love this unit and you will love Surfside! All the comforts of home! Destin's most popular theme parks, and seven of Destin's most popular golf courses are within 4 minutes. Rent boats (pontoon, or motorboats or jet skis) beach front and/or nearby. Bikes and scooters also available. Several of Destin's most popular restaurants shops are within 1 mile of Surfside. This unit on the 6th floor with a million dollar view of the Gulf of Mexico. Perfect for couple or couple with small child. This unit is like a hotel room studio/efficiency. It does not have a full kitchen (no stove) or separate living room. Our unit has king bed, private full bath, small refrigerator, microwave, coffee pot, & bistro table/chairs. We have private balcony (also has a table & chairs) which overlooks the awesome emerald green gulf. Our AWESOME STUDIO is a 'NON-SMOKING/NON-PET' unit and OUR ASSOCIATION POLICY PROHIBITS RENTALS TO ANYONE UNDER THE AGE OF 25 YEARS OLD. Cancellation Policy: Reservations cancelled 30 days prior to arrival will receive a Full Refund. Reservations cancelled less than the 30 day requirement will receive a full refund only if the unit is re-booked for the same amount of days at the same price. Damage deposit will be refunded immediately upon cancellation. If owner can re-book part or all of the reserved dates, even if for a lower rate, that amount will be refunded promptly. Destin's most popular theme parks, and 3 of Destin's most popular golf courses are within 4 minutes. The rest are within 20 min. Rent boats (pontoon, or motorboats or jet skis) beach front and/or nearby. Bikes and scooters also available. Several of Destin's most popular restaurants shops are within 1 mile of Surfside. Silver Sands Outlet Mall & Winn Dxie is less mile. POOL SIDE - 6TH FLOOR - UNOBSTRUCTED VIEWS OF THE EMERALD GREEN WATER & SUGAR WHITE SAND! 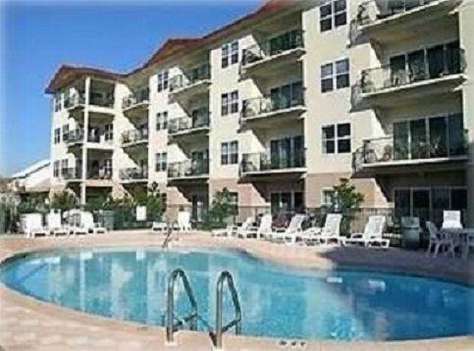 This pool side sixth-floor unit has newly remodeled kitchen & bath. This condo has a large master bedroom suite with king bed & featuring a Gulf view, lighted walk in closet, large shower area, and more. This is a split floor plan....the secluded second bedroom suite offers a Gulf view, two full sized beds, flat screen TV, closet, and a full bath. Kitchen is fully equipped, just like a home with breakfast bar and table for 4. The dining room has seating for 6. Full washer & dryer. The huge balcony runs the length of the condo and has access from each bedroom, the living room, and the kitchen! Full linens, towels, etc. are provided. Expertly furnished and accessorized. Book our "Home Away From Home" now! You will love it! Destin's most popular theme parks, and seven of Destin's most popular golf courses are within 4 minutes. Rent boats (pontoon, or motorboats or jet skis) beach front and/or nearby. Bikes and scooters also available. Several of Destin's most popular restaurants and shops are within walking distance of the condo. 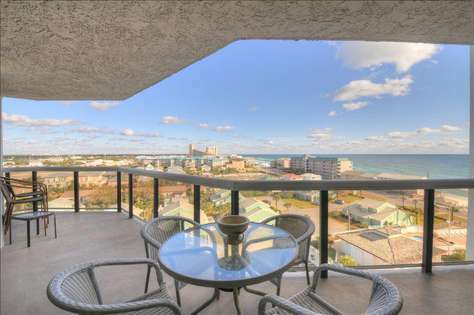 Our SPECTACULAR, 1,535 square feet, 3 BEDROOM/3 BATH CONDO AT SURFSIDE BEACH RESORT has AWESOME VIEWS of the EMERALD GREEN WATER. We have a very open floor plan with GLASS DOORS/WINDOWS from CEILING TO FLOOR. UNIT 708 & SURFSIDE AMENITIES! All rooms, except the 3rd bedroom lockout open onto a 28 FOOT BALCONY. The 3rd bedroom opens onto its own private 14 foot balcony and sleeps 4. Balcony enclosures have clear glass for unobstructed views. The huge master bedroom has a king-size bed, flat screen TV, large lighted walk-in closet, and spacious master bath with large glass-enclosed tub/shower. The second master features a queen size bed and 2 bunk beds, TV/DVD, and full bath. The third master (which is like a hotel room) can be rented as a 1 bedroom. It has own private entrance and private balcony with two queen size beds, TV/DVD, large closet, private full bath, refrigerator, microwave, coffee pot, dishes, linens. Our living room is beautifully decorated and includes a flat screen TV, and is open to the dining room which has seating for six. The remodeled kitchen features, granite countertops, black appliances, custom cabinets, breakfast bar, and a tile backsplash. Appliances include: stove, refrigerator, microwave, coffee pot, blender, and a washer/dryer. We provide full linens (sheets, bath towels, etc). Please bring your own beach towels. We have added many personal touches and items. Your every need has been anticipated. Destin's most popular theme parks, movie theater, and seven of Destin's most popular golf courses are within 4 minutes. Rent boats (pontoon, or motorboats or jet skis) beach front and/or nearby. Bikes and scooters also available. Several of Destin's most popular restaurants shops are within walking distance to Surfside. 708B IS a 1 bedroom efficiency similar to a hotel room. It sleeps 4 guests and is perfect for a couple or a couple with 2 small children. This unit DOES NOT HAVE A FULL KITCHEN (NO STOVE) OR SEPARATE LIVING ROOM. The unit has 2 queen beds private full bath, med size refrigerator, microwave, coffee pot, & bistro table/chairs for enjoying your favorite beverage & snacks while watching the beautiful emerald green gulf. We have private balcony (also has a table & chairs) which you can see the awesome emerald green gulf. Perfect for a very inexpensive "get away" at the beach, you can't beat the price for being at the beach with "toes in sand". 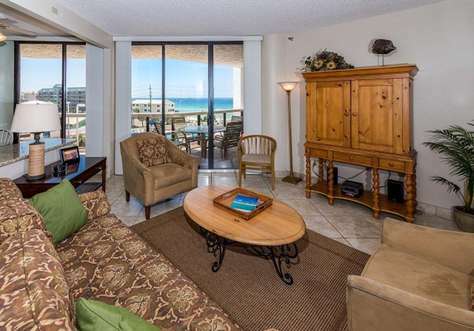 This unit at Surfside Beach Resort has awesome views of the emerald green waters of the Gulf of Mexico. Surfside is adjacent to Seascape Golf Course, very close to Silver Shells Designer Outlet Mall, Destin Commons Mall, cinemas, and many wonderful restaurants. Our SPECTACULAR, 1,152 square feet, 2 BEDROOM/2 BATH CONDO AT SURFSIDE BEACH RESORT has AWESOME VIEWS of the EMERALD GREEN WATER. We have a very opened floor plan with GLASS DOORS/WINDOWS from CEILING TO FLOOR. UNIT 708 2 BEDROOM & SURFSIDE AMENITIES! The huge MASTER BEDROOM with a king-size bed, FLAT SCREEN TV large lighted walk-in closet, and spacious master bath with large glass-enclosed tub/shower. Our LIVING ROOM is BEAUTIFULLY decorated and includes , FLAT SCREEN TV, with . DINING ROOM has seating for six. Destin's most popular theme parks, movie theater, and seven of Destin's most popular golf courses are within 4 minutes. Rent boats (pontoon, or motorboats or jet skis) beach front and/or nearby. Bikes and scooters also available short walk. Several of Destin's most popular restaurants shops are within walking distance to Surfside. Newly renovated kitchen Enjoy your next Destin vacation in this beautiful 2 bedroom condo! Owner recently installed new granite counters in kitchen and baths, new stainless steel kitchen appliances, and new tile in the bedrooms. 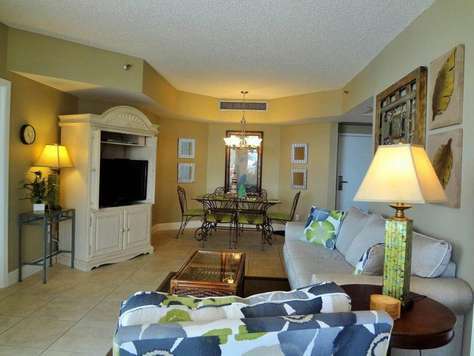 Beautiful condo located in Surfside Resort! Surfside's unique and angled floor plan is 'NOT' your typical shot-gun style floor plan. 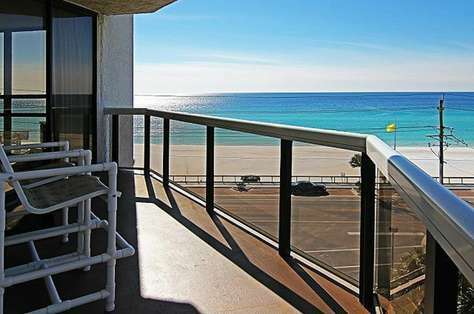 All rooms in this unit open to a huge 28-foot balcony with fantastic sunset views over the Gulf. Our Open Living Room/Dining Room is beautifully decorated. It includes TV/DVD and balcony access! The dining room has seating for six. This condo has a beautifully decorated master bedroom has a king-size bed, flat screen TV, large lighted walk-in closet, and spacious en-suite master bath. The second bedroom features 2-full sized beds, flat screen TV/DVD player and balcony access. There is a full bath next to this room. We welcome you to share in our home-away-from-home as your home-away-from-home. We have prepared for our very own use and for those who want the very best! This wonderful condo is a 'non-smoking' unit. POLICY PROHIBITS RENTALS TO ANYONE UNDER THE AGE OF 25. The Surfside Resort prohibits pets. 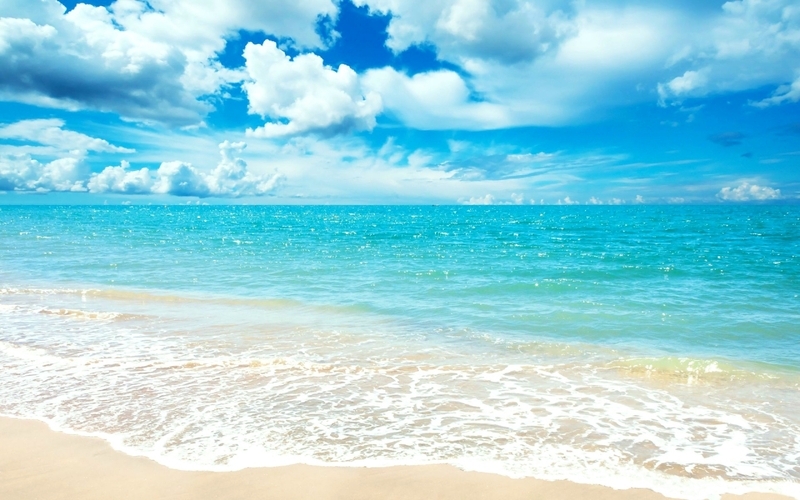 Reserve your favorite "TIME AT THE BEACH" today in "OUR-HOME-AWAY-FROM-HOME." Our SPECTACULAR, 1,617 square feet, 3 BEDROOM/3 BATH CONDO AT SURFSIDE BEACH RESORT has AWESOME VIEWS of the EMERALD GREEN WATER of the GULF OF MEXICAO. We have a very opened floor plan with GLASS DOORS/WINDOWS from CEILING TO FLOOR. The LIVING/DINING room is brilliantly designed with upscale details including an entertainment center with TV/DVD. The living room/dining room includes a mirrored wall that creates a stunning panoramic view of the GULF. The living room QUEEN SIZE SLEEPER SOFA to allow comfortable accommodations for 12. Our fully-furnished kitchen includes dishwasher, stove, refrig, micro, disposal, coffee maker, blender, toaster, fully stocked with dishes, even a crock pot. We have added many personal touches/items. Your every need has been anticipated. We also have washer/dryer and TV/VCR/DVDs in the living room and bedrooms. 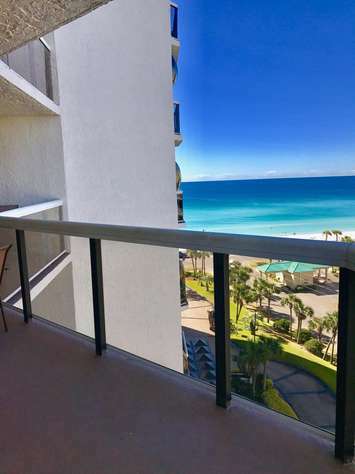 Our SPECTACULAR, 1,617 square feet, 2 BEDROOM/3 BATH CONDO AT SURFSIDE BEACH RESORT has AWESOME VIEWS of the EMERALD GREEN WATER of the GULF OF MEXICAO. We have a very opened floor plan with GLASS DOORS/WINDOWS from CEILING TO FLOOR. Our UNIQUE FLOOR PLAN provides GULF FRONT VIEWS FROM EVERY ROOM including ALL BEDROOMS. This is NOT your typical shot-gun style floor plan. EVERY BEDROOM opens onto a BALCONY through 9 foot sliding glass doors. The LARGE BALCONY is 28FT long and nearly 400SF in size. Our units are VERY SPACIOUS and OPEN with floor to ceiling windows with GULF front views. A unique feature of this building includes air-conditioned INTERIOR HALLWAYS and UNDERGROUND PARKING. Another neat feature are the clear safety glass balcony railings that enhance the view and provide better safety especially for small children. 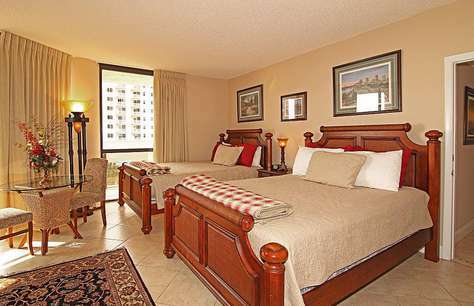 There are 2 HUGE MASTER BR SUITES with KING-size beds in our 3 BEDROOM units. They feature DESIGNER furnishings, TV/DVD, with SPACIOUS master bathrooms. The third bedroom features two FULL-size beds with decorator furnishings, TV/DVD, and its own bathroom with a large glass-enclosed shower. The LIVING/DINING room is brilliantly designed with upscale details including an entertainment center with TV/DVD and STEREO SYSTEM WITH CD PLAYER. The living room/dining room includes a mirrored wall that creates a stunning panoramic view of the GULF. The living room QUEEN SIZE SLEEPER SOFA to allow comfortable accommodations for 10. Our FULLY FURNISHED kitchen includes dishwasher, stove, refrigerator, microwave, disposal, coffee maker, blender, electric can opener, toaster, plates, glasses, cookware, even a crock pot, utensils, bowls, etc. We have added many personal touches/items. Your every need has been anticipated. There is PLENTY OF STORAGE to get your bags and 'things' out of your way while you are relaxing and enjoying our lovely condo. Full linens, towels, etc. are also provided. The huge balcony is completely furnished. PLEASE RESERVE YOUR TIME IN "PARADISE"
The Hotel Room (lockout suite) offers a private balcony. Complete with microwave, refrigerator, coffee maker and iron linens, dishes, etc. This unit is like a hotel room studio/efficiency. It does not have a full kitchen (no stove) or separate living room. Our unit has a king bed, private full bath, medium size refrigerator, microwave, coffee pot, & table/chairs for enjoying your favorite beverage & snacks while watching the beautiful emerald green gulf. We have private balcony (also has a table & chairs) which overlooks the awesome emerald green gulf. Destin's most popular theme parks, and seven of Destin's most popular golf courses are within 4 minutes. Surfside is adjacent to Seascape Golf Course, very close to Silver Shells Designer Outlet Mall, Destin Commons Mall, Cinemas, and many wonderful restaurants & Winn Dixie. Rent boats (pontoon, or motorboats or jet skis) beach front and/or nearby. Bikes and scooters also available. Our UNIQUE FLOOR PLAN provides GULF FRONT VIEWS FROM EVERY ROOM including ALL BEDROOMS. This is NOT your typical shot-gun style floor plan. EVERY BEDROOM opens onto a BALCONY through 9 foot sliding glass doors. The LARGE BALCONY is 28FT long Our units are VERY SPACIOUS and OPEN with floor to ceiling windows with GULF front views. Master has KING-size beds. They feature DESIGNER furnishings, TV/DVD, with SPACIOUS master bathrooms. The third bedroom features two FULL-size beds with decorator furnishings, TV/DVD, and its own bathroom with a large glass-enclosed shower. The LIVING/DINING room is brilliantly designed with upscale details including TV/DVD and STEREO SYSTEM WITH CD PLAYER. The living room/dining room includes a mirrored wall that creates a stunning panoramic view of the GULF. The living room QUEEN SIZE SLEEPER SOFA to allow comfortable accommodations for 10. All rooms, open onto a 28 FOOT BALCONY except THIRD MASTER locks-out (HOTEL UNIT) opens onto private 14 foot BALCONY. All balcony enclosures have clear glass from CEILING TO FLOOR. Our LIVING ROOM/DINING ROOM COMBINATION is PROFESSIONALLY DECORATED and includes, FLAT SCREEN TV/DVD, THE DINNING ROOM has seating for six. Our REMODELED kitchen features, BEAUTIFUL GRANITE COUNTERTOPS, NEW MABLE CABINETS, , Stove, refrigerator, microwave, disposal, washer/dryer, full linens, etc. We have added many personal touches and items. Your every need has been anticipated. Unit has a beautifully decorated MASTER BEDROOM with a king-size bed, FLAT TV/VCR, large lighted walk-in closet, and spacious master bath with SHOWER AND LARGE TUB (one of a kind in Surfside) The SECOND BEDROOM features 2-FULL SIZE beds FLAT SCREEN TV/DVD and full bath. Third bedroom is called a 'lockout', with private balcony. THIRD MASTER (HOTEL ROOM) can be rented as a 1 BEDROOM. It has OWN PRIVATE ENTRANCE with NEW KING SIZE bed, FLAT SCREEN, TV/DVD, closet, private BATH, microwave, coffee pot, dishes, linens. This is great for two families!!!! OUR UNIT IS PROFESSIONALLY DECORATED and ONE OF THE MOST REASONABLY PRICED UNIT IN ALL OF DESTIN. We welcome you to share in our; OUR home-away-from-home as YOUR home-away-from-home. We have prepared for OUR very own use and for those who want the VERY BEST!!! Reserve your favorite 'WEEK AT THE BEACH' today at 'PARADISE FOUND' OUR-HOME-AWAY-FROM-HOME'. The Hotel Room (lockout suite) offers a king size bed and private balcony. Complete with microwave, coffee maker and iron. This beautiful condo has been decorated with original works of art and a sophisticated beach theme. The gourmet kitchen, beatiful tiled floors, panoramic ceiling to floor windows, and many upgrades make this unit your perfect beach get-away! The master bedroom features a comfortable king sized bed, large en-suite bathroom, walk in closet, and balcony access with ocean views. 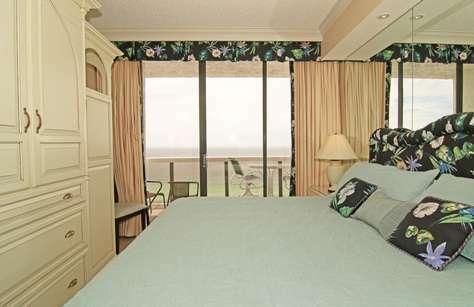 The second bedroom features 2 full sized beds and balcony access with ocean views. There is a queen sized sleeper sofa in the living room. Our unique, angled, floor plan provides GULF views from all rooms. This is 'NOT' your typical shot-gun style floor plan. All rooms are angled/open with glass doors/windows from ceiling to floor. All rooms open to a huge 28-foot balcony overlooking pool and beautiful GULF. There are 2 master bedroom suites. A huge master bedroom with a king-size bed with GULF view, beautiful furnishings, flat screen TV/VCR, large lighted walk-in closet, vanity table, and spacious master bath with large glass-enclosed shower. The second bedroom with Gulf view has two full-size beds with beautiful furnishings, flat screen TV/VCR, closet, and full bath with tub/shower. 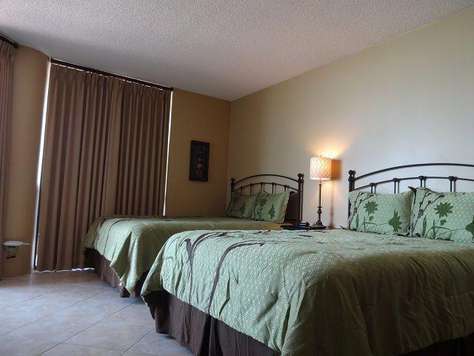 Our 3rd bedroom unit has a king-size bed can be rented as a separate unit or as a 3rd bedroom. They all feature DESIGNER furnishings, tv/dvd, SPACIOUS master bathrooms. The LIVING/DINING room is brilliantly designed with upscale details including Flat scree TV/DD. The living room/dining room includes a mirrored wall that creates a stunning panoramic view of the GULF. The living room QUEEN SIZE SLEEPER SOFA to allow comfortable accommodations for 10. Our fully-furnished kitchen includes dishwasher, stove, refrig, micro, disposal, coffee maker, blender, toaster, fully stocked with dishes, even a crock pot. We have added many personal touches/items. Your every need has been anticipated. PENTHOUSE FLOOR! STUNNING VIEWS OF THE GULF!!! Gourmet Kitchen with eat-in bar, granite countertops, top of the line appliances. Master Bedroom Suite has a luxurious queen size bed with connected bath. The Guest Bedroom offers two full size beds with separate bath. Our unique angled floorplan has incredible Gulf views from every room. OUR UNIT IS PROFESSIONALLY DECORATED and ONE OF THE MOST REASONABLY PRICED UNIT IN ALL OF DESTIN. We welcome you to share in OUR home-away-from-home as YOUR home-away-from-home. We have prepared for OUR very own use and for those who want the VERY BEST!!! Watch dolphins from your balcony or enjoy the beauty of a morning sunrise! Surfside 1609 is located just steps from the sugar white sands of the Gulf of Mexico and offers plenty of space for up to 6 people. This 2 bedroom and 2 bathroom unit has a full kitchen, equipped with all of the cookware and appliances needed to create great meals during your stay. All of the rooms in this condo have access to the huge balcony that runs the length of the condo! The master features a king sized bed, en-suite bathroom, large walk in closet, and balcony access with views of the Gulf. The second bedroom features a full sized bed, a large closet, balcony access, with a full bathroom in the adjoining hall. The living room's queen sized sleeper sofa allows additional sleeping accomodations for 2 more guests. The views of the emerald green gulf, from the 3 balconies, are AWESOME. The home’s interior is SPECTACULAR which includes an elevator, an unbelievable trim package, top of the line cabinets, top of the line kitchen appliances, all granite counter tops, beautiful travertine and wood floors, wet bar with sink and refrigeration in “both” master bedrooms, etc. This is truly a home for people with discriminating taste. As noted above this home sleeps up to 16 people which is ideal for several families. The house includes two (2) master bedrooms with 'king' size beds. Also, two (2) other bedrooms include 'king' beds. A bunkroom includes two (2) queens and two (2) twins. There is also a pullout queen bed in the 2nd floor living area. The home has three (3) floors and three (3) balconies. Don’t worry about climbing stairs; in that, there is an elevator. The first floor includes a master bedroom and a bunk room. The master bedroom includes a refrigerated wine bar and private bath and a 46” flat screen TV. The master bedroom leads directly onto the first floor balcony, with a heated splash pool and direct entry to the beach. The bunkroom includes two (2) queens and two (2) twins and flat screen TV. The first floor also includes an oversized washer & dryer. The second floor includes a gourmet kitchen and beautiful living & dining room with a queen size sofa sleeper and 46” flat screen TV, opening to the second floor balcony which has a MILLION dollar view of the emerald green waters and your private beach. The second floor also has a guest bedroom (king size bed), 37” flat screen TV and full bath. The third floor has the second master bedroom with king bedding, 37” TV, private bath with a whirl pool bath, separate shower, two (2) sinks and refrigerated wine bar & sink. The bedroom adjoins a balcony providing breath taking views and sunsets. The third floor also has a quest bedroom, with king size bedding, a 32” flat screen TV and a full bath. This townhouse is a part of the Frangista community which has a neighborhood pool with bath house and whirlpool. The pool is across the street from the townhouse. Within approximately ½ mile (short walk) of the townhouse, there are five (5) restaurants, a convenience store, beach store, coffee shop, wine store, and rental bikes/scooters. Silver sands outlet mall, with over 100 stores, is less than 2 miles. You will love the location! * Whales Tail Restaurant on the beach. * Private, deeded beach access to the world's most beautiful beaches. Our beautiful tiled kitchen W/ BREAKFAST BAR w/3 bar stools, table w/seating for 6, white cabinets with granite counter tops, Stove, refrigerator, microwave, disposal, washer/dryer, full linens, etc. We have added many personal touches and items. Your every need has been anticipated. 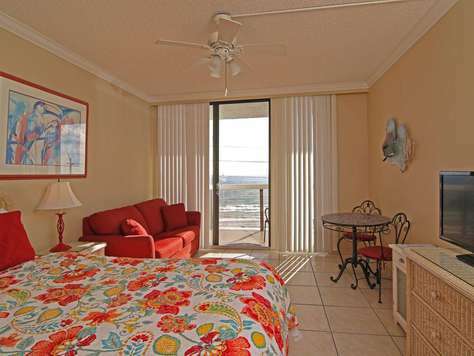 OUR UNIT IS BEAUTIFULLY DECORATED and ONE OF THE MOST REASONABLY PRICED UNIT IN ALL OF DESTIN. We welcome you to share in our; OUR home-away-from-home as YOUR home-away-from-home. We have prepared for OUR very own use and for those who want the VERY BEST!!! 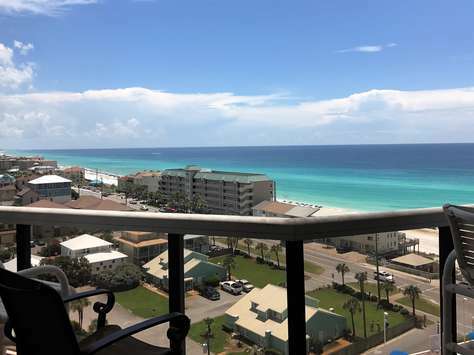 Enjoy the unobstructed views of the stunning white sand of the Emerald Coast in Destin from the balcony of Majestic Sun #607A! With accomodations for up to 6 people, this lovely vacation condo is a great choice for your next family vacation! The master bedroom features a king sized bed and en-suite bathroom with a tub/shower combination. For the kids, there is fun set of bunk beds tucked into the hallway alcove. The hall bath features a large walk in shower. From the open living room, kitchen, dining room area, you can see the beautfiul emerald waters of the Gulf! The living room has a queen sleeper sofa. There is a washer and dryer located in the unit for your convenience and comfort. Majestic Sun's private beach is located directly across the 25 mph 2 lane beach road. 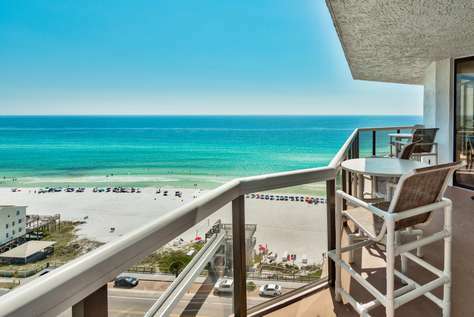 It is just steps from the building to the sugar white sand of the Emerald Coast! This resort's amenities are incredible! Majestic Sun features a 3,200 square foot multi-level indoor/outdoor pool, hot tub, and onsite fitness facility. It is located near some fabulous restaurants; several are within walking distance! Serve up a match on one of the nearby tennis courts (for a small fee) , or head over to the championship golf course and play a liesurely game with friends or family. If shopping is your thing, the Silver Sands Outlet Mall is minutes away as is the open air mall, Destin Commons, which has been voted "Best Place to Shop" by readers of Emerald Coast Magazine.